My skin lightening adventure was fun, i used a lot of lotions, soaps, exfoliants and so much more. But Guess what?? It lead to dry skin. Yep! I mean these washed away my skin oils and made my skin looked so dull and pale. I wasn't ready to get any bit darker tho, so i searched for a skin lightening lotion with a strong moisturizing effect. 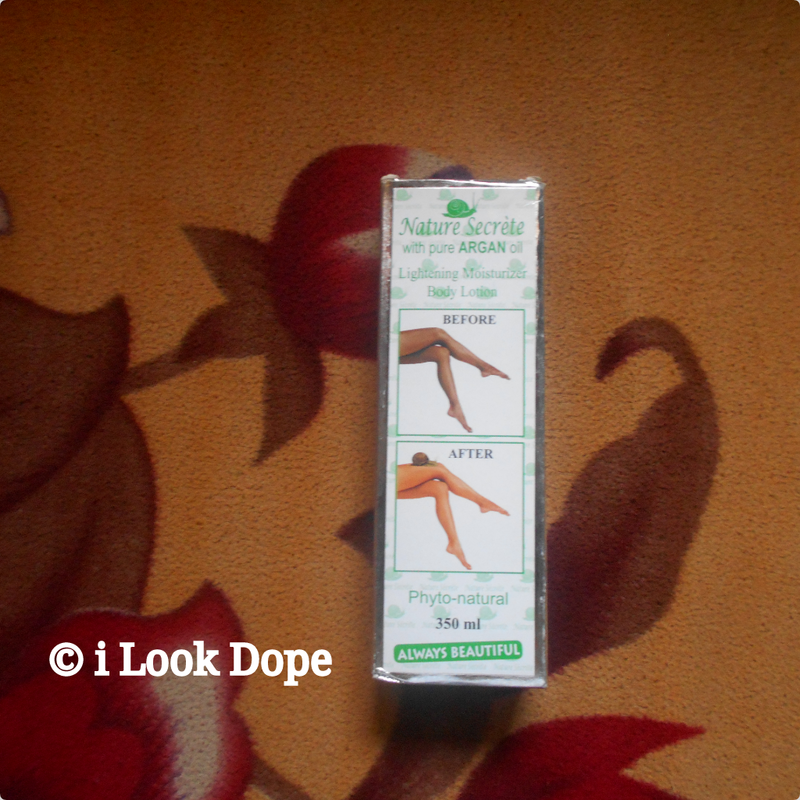 That was when i came across Nature secrète lightening moisturizing lotion. And you know what? "I don use 3 bottles now o". That's for approximately 3 months now and it was all good. I'll be sharing my experiences with you guys bellow. Nature secrète lightening moisturizing body lotion with pure ARGAN oil gave a much brighter & luminous appearance to my skin. It faded off my hyper pigmentation spots and help to prevent their appearance. This concentrated formulae with ARGAN oil works gently and effectively to unify and clarify your complexion. Enriched with lightening plant extracts, Nature secrète lightening moisturizing body lotion moisturizes, protects and help your skin retain its elasticity without leaving a greasy film. It left my skin silky, soft and radiant by offering a pleasant sensation of freshness. This formula is a non greasy lotion that feels really light to the skin. It absorbs pretty fast and the chances of making you sweat is 10/100. Nature secrète lightening moisturizing body lotion with pure ARGAN oil is white in colour and smells pretty good but smells awkward after application. The exact way it smell is undescribable but trust me it ain't bad at all. 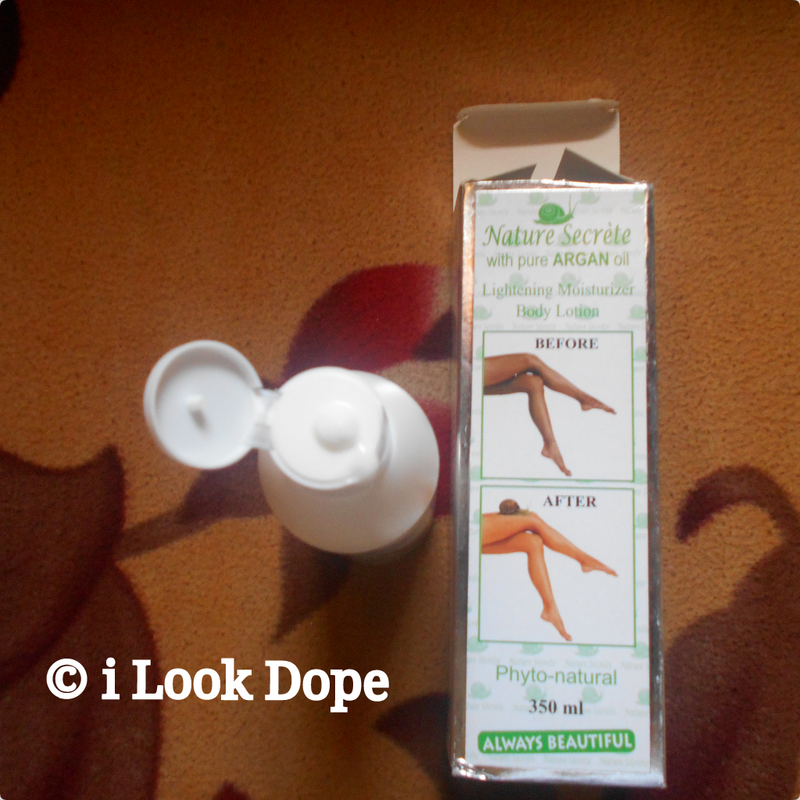 Nature secrète lightening moisturizing body lotion with pure ARGAN oil is one of the lotion that have spent a much longer time on my shelf. It is a 350ml sized lotion. But hey! the reason why this lotion lasted for a month could be because i don't use it in the evenings too. I use it in the mornings only because i don't wanna be so light anymore. I just wanna be chocolate. Nature secrète lightening moisturizing body lotion has one of the most colourful packaging I've ever seen since my years of using lotions. And guess what? It's designed in green and white which is the flag of Nigeria...Lol. And No, it wasn't manufactured in Nigeria at all, seems a coincidence. This lotion comes in a rectangular prism designed with green and white all over. The front and back of it has a before & after photos of a female legs which was once darker before and became lighter after. There's this image of a snail at the top tho, green in colour. The side of it has the product promises, ingredients and some unbelievable before & after photos which appears to be real. One is that of a lady that has a lot of acne / pimples on her face before and her face became smooth after. Another photo is that of dark knuckles that got really clear after use of this lotion as stated. 3. Low tendency of pigmentation and uneven skin tone when applied evenly. 5. Very moisturizing, gave me a glow. 6. Contains Kojic acid & fruit acid which are natural skin lighteners. 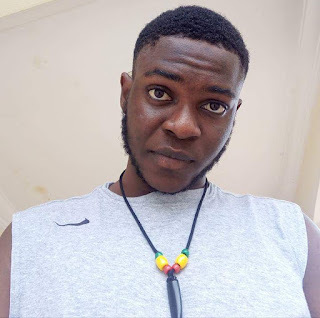 I started using Nature secrète lightening moisturizing body lotion 3 months ago, and i bought my first bottle for N1,200 (One Thousand Two Hundred Nigerian Naira). But later on, I went for my second bottle they sold it to me for N1,300. And just last week, i bought my third bottle for N1,500. Yep, I have decided to make this my permanent skin lotion & i wont stop it any soon. Remember, price may differ with your location or seller. As seen here in the pack, Nature secrète lightening moisturizing body lotion is made of AQUA, PARAFFINUM, LIQUIDUM, CETYL ALCOHOL, PROPYLENE GLYCOL, GLYCERIN, 1,4-BENZENEDOIL, FRUIT ACIDS, KOJIC ACID, FRUIT ACIDS, ARBITIN, MYRISTATE ISOPROPYL, SODUIM METHABISULFITE, SODUIM SULFITE, DEMETHICONE, SODUIM SULFITE, XANTHANE GUM, SALICYLIC ACID, SODUIM BENZOATE, UVB-UVA, EDTA, BHT, BHA, LINALOOL, LIMONENE, HEXYL CINNAMAL, TOCOPHEROL, D'ACETATE, FRAGRANCE. Use Nature secrète lightening moisturizing body lotion in the mornings & evenings if you wanna get several shades lighter and stay away from the sun. This lotion best works with Crusader Medicated Soap, Yes, ive used it my self and it was amazing. Use this lotion only in the mornings if you just wanna brighten up a little bit or maintain your colour. Do not apply to vital organs like eyes etc. Keep Out of reach of children. If skin reaction occurs discontinue use. IS NATURE SECRETE BODY LOTION SAFE?? Despite the fact that Nature secrète lightening moisturizing body lotion can smell a bit nasty after application on skin, there's no unsafe tendencies that i observed, however, i cant be certain that its a very safe lotion. But to me, its good & can be used by everyone. This lotion can be %80 - %90 Okay for use. 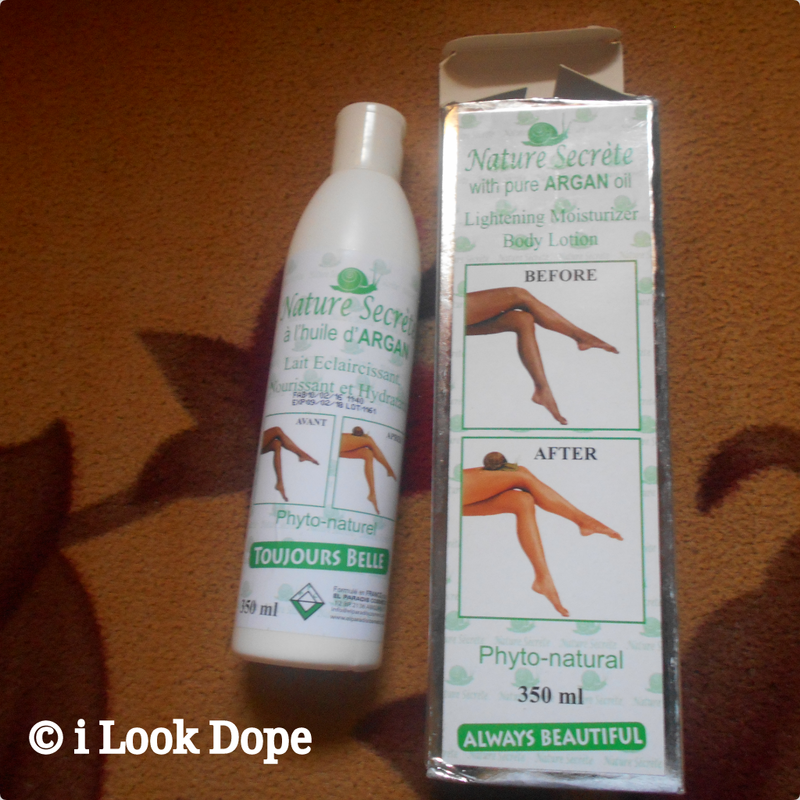 WHERE TO BUY NATURE SECRETE BODY LOTION?? Thanks Chris, it actually working. The only thing is it's lightening too much than wanted. I had to stop applying on my face for now, though my acne spots are not yet fully cleared. Wanna maintain chocolate, not light skin. Oh, okay dear. Maybe its because you use it twice a day. It just brightens me tho. The Product Is Absolutely Awesome. With Patient and Consistency, Good Result Is Guaranteed. Good to hear bro. I'm glad it worked. Stay tuned to my blog. Seems you're edo, yeo i'm edo too. Whats your skin colour at the moment?